The organization that controls the Laurel Burch designs is still the same one that Laurel herself set up back in the 1970s. This is Laurel Burch Artworks Inc. which is still in power and control over all of Laurel’s designs now that she has passed on from this earthly dwelling. Since Laurel’s death in 2007, her son, Jay Burch, is the CEO and president of this organization. Just as his mother did, he makes it possible for a manufacture to purchase the rights to make Laurel Burch products. This type of license is necessary if you wish to distribute or produce any of the over 2000 designs used of Laurel Burch creation since they hold the global licensing rights for this type of product. This is not how it always was. Back in the 1960’s, Laurel was just a single artist that created everything herself. All of her creations, mostly handmade beads and wire, were made by her in her kitchen. The main tools used were the back of a frying pan and a hammer. This all changed in the early 1970s when Laurel met an Indian business man named Shashi Singapuri. Shashi Singapuri was a business man that had connections in China. In 1971 he convinced Laurel to visit China as a possible source of manufacturing her art creations. This was back in the days before China was a global player in the economic world and was still considered a closed market. This is when Laurel learned about the painting of enamel called cloisonné. She also learned about diplomacy when the first pieces were presented to her and the eyes had been changed. Laurel thanked them but added that she would need her art work to be created as she drew them and that there should be no interpretation of her designs. Singapuri financially backed the mass production of Laurels’ artwork. This is when the number of types of items Laurel Burch artwork expanded. Not only was Laurel working with metal and wood, but her designs were being applied to paper, porcelain and fabric. This is when Laurel’s art became worldwide known and recognizable. This occurred since her products were now available in most of the large markets around the globe. 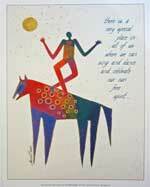 In 1979, Laurel separated from Singapuri and formed her own company called Laurel Burch Inc. This is the same company that exists today. It was shortly after this that Laurel decided that her physical limitations made it too difficult to oversee all of the manufacturing of her products. This is when she introduced the idea of selling licenses to manufacturers and distributors. It also made it possible for Laurel to again concentrate on creating art instead of manufacturing it. Today the legend of Laurel Burch lives on in the hands of her son Jay and is still selling licenses to those interested. Her daughter’s career took the path of film and she is currently doing a biography of her mother’s life.